Knapton Hall Cottage01263 715779work01603 870304fax Self-cateringSituated in the courtyard of Knapton Hall, this excellent cottage has been refurbished to a luxurious standard. Enjoying comfortable furniture, modern utilities and spacious rooms, guests can make the most of the wonderful Norfolk countryside using this superb accommodation as a tranquil place of retreat. During the summer months guests can take advantage of the outdoor swimming pool. The appealing brick and flint exterior of Knapton Hall Cottage. 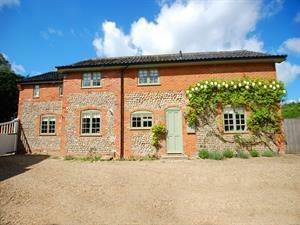 Situated in the courtyard of Knapton Hall, this excellent cottage has been refurbished to a luxurious standard. Enjoying comfortable furniture, modern utilities and spacious rooms, guests can make the most of the wonderful Norfolk countryside using this superb accommodation as a tranquil place of retreat. During the summer months guests can take advantage of the outdoor swimming pool.